TORONTO (Reuters) - A house fire in the eastern Canadian city of Halifax has killed seven children from the same family, Halifax police said on Tuesday. The Canadian Broadcasting Corp identified the family as Syrian refugees and said the children ranged from three months to 17 years old. A man and a woman were injured and being treated in a hospital. Police and fire officials have not yet determined the cause of the fire. Neighbor Danielle Burt who lived next to the family told CTV News she heard a loud noise shortly after 12:30 a.m. EST (0530 GMT) and saw a woman and man fleeing the home. "The mother was on the grass, praying I guess, bowing her hands down, and pulling on my husband's arm to call 911," Burt said. 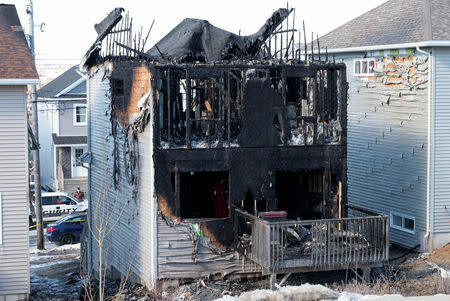 Halifax Mayor Mike Savage tweeted, “As we wait for more details on this morning's tragic fire in Spryfield, our entire municipality is heartbroken and our thoughts are with the loved ones of the family." Spryfield is an unincorporated community in Halifax.